Laboring in birth is hard work but today we are making it harder than it needs to be. The secret is to find ways to create optimum space for the baby to move into and through the pelvis. BirthWorks philosophy believes that “Birth is Instinctive” and that includes the baby knowing how to move through his mother to be born. Remember that the baby was conceived in the uterus while low in the pelvis. As he grows he moves up through the pelvis with the uterus into the abdomen where there is more room to grow. So in an instinctive way, we can know that since the baby has already made that journey once, it is familiar to him. What is familiar feels safe. After moving up to his mother’s abdomen and reaching his birth weight, he is ready to move back down through the pelvis to be born. But now there is one difference – he has grown. At this time it is essential that a mother positions herself in ways to optimize the space in which he can move. One position to avoid is the deep squatting position. In this position, the pelvis is tipped backward as western women squat sitting on their heels which moves the pelvis into a posterior position. This is a way to decrease space in which the baby can move. Any position that tips the pelvis backward is a way to make descent of the baby through the pelvis more difficult. It is desirable to have a forward pelvis in labor which offers more room for the baby. There is another reason to avoid a deep squatting position in labor. In labor, it is advantageous to increase the angle between the mother’s spine and the opening of the pelvis so the baby can position himself optimally. In order to do this, the woman in labor needs to keep her knees below her waist. In a deep squatting position, the knees are above the waist. Keeping the knees below the waist is the BirthWorks Third Principle of Optimal Pelvic Positioning that all women of childbearing age need to understand. There is a great position called “The Dangle Squat.” (see diagram) In this position two people can sit on the bed or high chairs with a space in between. The woman in labor stands between them and places her forearms on their thighs. Then she drops down into a partial squat, keeping her knees below her waist. She can feel the stretch in her upper body so that the forces going up are balancing the forces going down. This is a position that opens the pelvis. She stays there for the duration of the contraction and then comes back up to a standing position and walks. The Dangle Squat is an easy one to maintain for her helpers as well which is an important consideration in any birth. Saying “No” to positions that decrease space in the pelvis and saying “Yes” to those that increase space in the pelvis makes a significant impact in the birth experience. Mom, baby and family will be thankful. My husband and I attended the Birth Works (birthing class) at Beach Cities this past October. It was taught by Janell Bartzatt. This was our 3rd baby. The first two were healthy, hospital births. We had taken a birthing class at the hospital 7 years ago with our first child and almost didn’t sign up for this one. But because it was our first out-of-hospital birth, we decided it would probably be a good idea. I think we both felt pretty knowledgeable already on birth! But we both learned more from this class than we had through reading dozens of books and living through two deliveries! Janell’s class not only covers a kind of what to expect, physically. But it also went through what to expect, emotionally. I left the class with such a clear understanding of what baby is going through during that labor, how I can help assist, and how to manage my pain. My husband felt more involved too. He had a better understanding of what he could do to help me through it. We talked about fears and concerns we may have and how to move them to a place of control. Knowledge is power. So many of my fears were just from not knowing. I left the class feeling empowered and that I could do this! It is so natural and not scary. Janell’s understanding on the topic made the class fun- it was a safe place to ask questions and to find real answers. My daughter was born at Beach Cities 11 days ago on Christmas Eve morning. To say it was the perfect birth is an understatement. It was really everything I had wanted it to be. I really owe so much of that to Janell and this class. I was able to talk to myself to relax and breathe. My husband knew counter pressure points to help with the pain when it got really intense. Labor wasn’t happening to me- I was 100% in control. I was 100% present and it was amazing! The human body’s urge to eat is powerful! We love eating socially, snacking, for comfort and when under stress. But when we get into a habit of eating for the wrong reasons, the toxic hunger we experience gives wrong signals to us as we haven’t met the needs of our body. I love the idea of understanding the difference between toxic hunger and true hunger. Toxic hunger is associated with food addiction – that feeling inside that makes us want some foods so much that we can’t stop eating them because they taste so good. Getting rid of such food addictions helps us to get back in control of our lives. It doesn’t mean eating less, but rather eating more of the right kinds of foods. 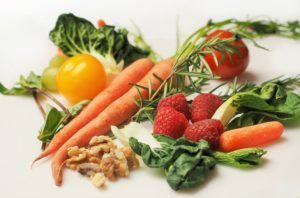 Macronutrients are foods that have low nutrients per calorie density scores (less healthy) whereas micronutrients are foods that have high nutrients per calorie density scores (more healthy). Micronutrients are super foods that offer the most protection against disease. Examples are kale, collard greens, mustard greens, watercress, Swiss Chard, Bok Choy, spinach, and arugula to name a few. You can see that these are mostly the leafy greens. Eating the stalks as well offers high nutrient benefits. Just cut it up into little pieces and put into your stews and salads. Other foods include vegetables such as Brussels Sprouts, Carrots, Cabbage, Broccoli and Cauliflower. In contrast, the macronutrients offer little health benefits and tend to be higher in sugar, salt, and fat, which makes them addictive. These include white bread, white pasta, French fries, Cheddar cheese, apple juice, olive oil, vanilla ice cream, corn chips and Cola and other soft drinks. What is interesting is that if you can stay away from these foods for 10-21 days, your taste buds actually change and you will find yourself not craving them as much anymore. The brain can only be fueled by glucose and needs it to function. Our bodies break down muscle tissue to make glucose for the brain. In digestion there are two stages: the anabolic stage and catabolic stage. The anabolic stage of eating and digestion is where the body breaks down foods to make “you.” Healing of tissues does not happen in this stage. In the catabolic phase, the body is working hard to heal itself. Eating macronutrients, the body thinks it feels hunger when it is really toxic hunger. Instead of burning off the food, we feel like eating again. Then there is a feeling of withdrawal which is detoxification. The Standard American Diet (SAD) is so toxic that it is like drinking ten cups of coffee a day. If you lose toxic hunger, then in the catabolic phase, instead of feeling discomfort from withdrawal, you’ll feel okay and not hungry. The secret here is learning to achieve micronutrient atoms so that you will feel true hunger. There are other added benefits such as improved skin, better eye sight, improved quality of life, and better breathing. Work to make salads your main dish of the day. Add seeds and nuts to increase absorption of the micronutrients. Be aware of the micronutrients you are eating and how good they make you feel. Eating micronutrients helps you to feel real hunger along with a heightened sense of taste so you’ll enjoy your food more. Be aware of the feelings you have with true hunger as opposed to toxic hunger. Be aware of how good it feels to be healthy and not controlled by your food addictions. Your body and your baby or babies will thank you for it. Not too long ago, somebody in a Facebook group I’m in posted a beautiful home birth picture (yay! ), with a caption stating something along the lines of “Born at home, in water, lifted him out myself, no eye ointment, no vaccines, no Vitamin K! Proud natural warrior mama!” I experienced a moment of alarm. This may surprise you, being as I had out-of hospital births for all three of my children and am of course very supportive of this “warrior mama’s” water birth. The part of that post that got me was the “no Vitamin K” battle cry. I have experienced an uptick in clients asking about Vitamin K refusal. What is that about? I believe that we have a couple of things happening here. One, some parents are so excited to give their child a gentle, “natural” birth, that they choose to refuse anything that comes from modern medicine. Two, care providers have perhaps done themselves a disservice by grouping eye ointment administration, Hepatitis B vaccination, and Vitamin K administration together in their “newborn procedures” discussions. The thing is, the science on eye ointment isn’t that great, Hepatitis B isn’t generally an immediate threat to a newborn . . . but Vitamin K administration DOES have very solid research supporting it, and it IS an immediate and severe (if rare) threat to a newborn. As BirthWorks educators, I believe that we need to be clear when an issue is truly a matter of “preference” and when there is an actual scientific safety concern. Sometimes I feel that I don’t want to “alienate” parents by taking a research-based position that they may not like to hear, but I do think it is our responsibility. While I always encourage clients to consider their own wishes in the face of non-evidence-supported birth procedures, the science is clear here. So, I’ve started giving a more in-depth and explicit treatment of Vitamin K administration, and decided to highlight this concern in the BirthWorks context. That said, my job is to present the information and facilitate discussion, and not to judge. If a parent still chooses to decline Vitamin K administration, I would continue to support them. The following information is based on Rebecca Dekker’s Evidence Based Birth signature article on Vitamin K, and on the Center for Disease Control and the American Academy of Pediatrics’ recommendations. Please see the hyperlinked sources for greater detail and actual research citations. This discussion is meant to raise awareness and introduce the topics to parents. Are Babies “Deficient” in Vitamin K? In a word, yes. Humans can’t make Vitamin K, or store it very well. We get it in our diets, but there’s not very much of it in breast milk. It does not cross the placenta very well, so even mothers who consume a lot of Vitamin K will have a baby born “deficient,” because all babies are born deficient. This is not “unnatural”, babies have many immature systems at birth. However, it is risky to them, just as their immature immune system puts them at risk for illness. “Natural” does not necessarily equate with “safe”. Early, within the first 24 hours of life. Usually occurs in skin, brain and abdomen. Classical, within days 2-7 of life, most often days 2-3 because that’s when levels have dropped to their lowest but baby isn’t eating enough to replace it. Often occurs in gastrointestinal system, umbilical cord site, skin, nose, and circumcision site. Late, usually during weeks 3-8 of life. Least common but statistically the most serious as far as fatality and severe injuries are concerned. Often occurs in brain, skin and gastrointestinal tract. Babies can experience a late bleed up to 6 months after birth. Does a Baby Have to Experience Trauma to Trigger Bleeding? I saw a blog post stating that Vitamin K was administered “in case the baby is in a car accident on the way home.” WRONG! First of all, even a gentle birth can cause minor bruising in a baby, and if their blood can’t clot, then “minor” can become “major”. Secondly, case studies of VKDB often find no known cause. It can be related to the cord stump or circumcision, but more often than not, they just start bleeding and can’t stop. Does a Vitamin K Shot Work? Yes, it does! Infants who receive Vitamin K at birth have almost no chance of getting VKDB. A study in England in 2013 showed that out of 64 million births in 18 years, only 2 babies who received a Vitamin K injection developed VKDB. Two. Out of 64 million. Comparatively, data from other European countries indicate that with no Vitamin K, VKDB occurs in 4.4-10.5 per 100,000 births. In Asia, the rate is higher, 1/6000 births, probably due to both dietary and genetic factors. No, not any more than with any other injection – pain (which you can mitigate by nursing through the shot) and redness/swelling at the injection site. There have been NO reported cases of severe allergic reaction, severe injury or fatality from the modern fat-soluble injection form. (The form given in the 1950’s and 1960’s was less safe.) So, there are NO reported fatalities from getting the shot, but MANY reported severe injuries or fatalities from VKDB. I will point you toward Evidence Based Birth for a more detailed discussion if you are interested, but 1) there is no FDA – approved oral version and 2) the three-dose oral version given sometimes in Europe is less effective. This is a very brief overview, and I would invite you to read further from reputable scientific sources such as Evidence Based Birth, the Center for Disease Control, and HealthyChildren.org . . . and most importantly, talk to your care providers! Natural is great, but in this case, science is definitely better. Do you believe pregnant women need to be taught how to breathe when preparing for their labors? Just as women are born with the knowledge about how to give birth, so they have also learned to breathe when they were born. There are a number of concerns about trying to teach breathing techniques to birthing women. The knowledge about how to give birth is in our primal brains. That is the oldest part of the brain that is back near the cerebellum and brainstem. Those are the most instinctive parts of our brain that regulate our primal needs such as the heartbeat, sleep, and breathing. When a woman is in labor, she needs to be in her primal brain so the part of her that knows how to birth can do so without any disturbance from the neocortex or thinking brain that is the outer part of the brain. Women who are in their primal brain will have the sensations of people and sounds being in the distance. They will feel, as Michel Odent MD says, as if they are on another planet. They are neither here nor there. This means they have surrendered to the process of birth and allowing their bodies to birth in an instinctive way. There is a wonderful story called “The White Room” told to us by Bethany Hays, OB GYN who is on our BirthWorks Board of Advisors. She was with a woman in birth who was having very strong contractions and had a petrified look on her face with wide panicky eyes. Bethany walked over to her and simply asked “Where do you want to go?” The woman just continued staring. Bethany said, “Wherever that place is, go there now.” And the woman left. She was still there but her consciousness had gone elsewhere. Bethany continued monitoring the heartbeat and all was fine. Sometime later, the woman started becoming conscious again and was bearing down to birth her baby. At a follow-up appointment, Bethany asked her, “So where did you go?” The woman responded, “I went to the white room where my uncle who passed away three years ago, held my hand.” This woman had an out-of-body experience that was out of space, out of time, but very much possible in the instinctive brain. Anytime a woman in labor needs to think about something, she is more present in her neocortex or thinking brain. This is very important information for any doulas or childbirth educators, and any of the birth team. They need to think, “What might I say that will disturb her labor?” Anytime they ask a question, they are disturbing her labor and her ability to move into her primal brain. Imagine a doula asking her “Was that contraction stronger than the last one?” “Would you like to change positions?” “Would you like a glass of water?” “How are you feeling right now?” These all have the potential of keeping her out of her instinctive, primal brain that already knows how to give birth. More silence and working with energy are needed. In BirthWorks, we do not teach breathing patterns for these reasons because a woman who has been taught different breathing patterns for different parts of labor, will be thinking, “Should I use this breathing pattern now, or that one?” Not only does this disturb her instinctive brain, but it also keeps her from being in touch with her body that already knows how to give birth. If she can have faith and trust in her body, she will be able to have it be her guide in labor. Increases confidence and decreases fear in labor. Sends an important message to the body, keeping it more in balance and equilibrium. Keeps her entire body relaxed. Helps a woman to have more energy for the work of labor. Other ways to avoid stimulating the neocortex besides asking rational, thinking, logical questions, include keeping lights dim, having privacy which simply means not feeling observed, and not moving from one room to another. But most importantly, childbirth preparation classes need to emphasize the idea of slow, deep breathing all the way through labor with all the benefits it offers. Teaching breathing techniques is a way to disturb labor. When slow, deep breathing is practiced in life, it is also easier to do when in labor. Attending a birth as a doula can bring out many emotions, especially for a doula who has given birth herself. This is true for me. I have been to many births as a doula and there has not been a single birth that I didn’t shed some tears. I shed my tears because I am genuinely happy for the moms that I help guide during their births. However, I also shed my tears because I am sad. But why would I be sad while I am attending the birth of another woman’s child? The following will explain the feelings I experience as I describe the typical scenario of the births I attend. After many hours of labor, the mother will be ready to birth her child. Her partner will be sitting next to her, holding her hand while gazing into her eyes. The partner will gently stroke her hair and give her a sip of water. The exhaustion can be seen in their faces from the hard work of labor. In between the mother’s contractions, her partner will give her a kiss on the forehead and tell her that soon they will be able to meet their baby. The birth attendant will arrive and get ready to catch the baby. I, along with the partner, will stand by the mother’s side. We will cheer her on as she works hard to push her baby out of her womb. She will grunt and groan, and say she can’t do it and we will persist and tell her she’s doing it. Before we know it, we will see her baby start to emerge. I will witness the look of amazement on her partner’s face. The baby will slip out of the mother’s body and we will all wait for the first cry. Finally, after what will seem like eternity, we will hear it. The mother and her partner will be reassured by that wonderful sound. The mother will hold her baby in her arms and the couple will look lovingly down at their baby with joy as they experience the miracle of birth! It is at this point that my tears flow. As I mentioned, part of the reason is because I am happy for this couple who is now meeting their child for the first time. But the other part of it is because I am sad as memories of my own births start to fill my mind like a beautiful storm going on inside my head. After giving birth to four children, I remember the closeness that my husband and I felt as he held my hand and waited for our babies to be born. I know what that moment feels like to finally hold your baby against your skin after those long hours of labor. I know the smell of a newborn baby and the excitement of finding out their hair color, or whose nose they have. I know the bond that is felt when you look in your baby’s eyes and they look back at you. I know what it feels like to put your baby to your breast and know that you helped create this individual that you are now nourishing. These first moments are like no other; they are special and one of a kind. I look at the mother holding her baby with her partner by her side and I think back at my labors and first moments of birth after each of my children were born. The tears flow because I miss these moments; I miss them badly and deeply. They were some of the most beautiful and intense moments of my life that had a very powerful impact on me down to my inner soul. I know that these moments will never come again for me. After a short while, I will get my emotions in check. My tears will stop flowing and I will place my mind back into the present. I will look at the beautiful sight before me of this couple holding their newborn baby and I will be reminded that there is truly no love like the love a mother has for her child. The thought of this will drown out my sadness and I will leave the new family to bond with a smile on my face and a feeling of warmth in my heart.